Treat someone special to our new seasonal gift box, decorated by Japanese artist Akinori Shimodaira with illustrations of summertime favorites, including vibrant starfish, shellfish, and fireworks. 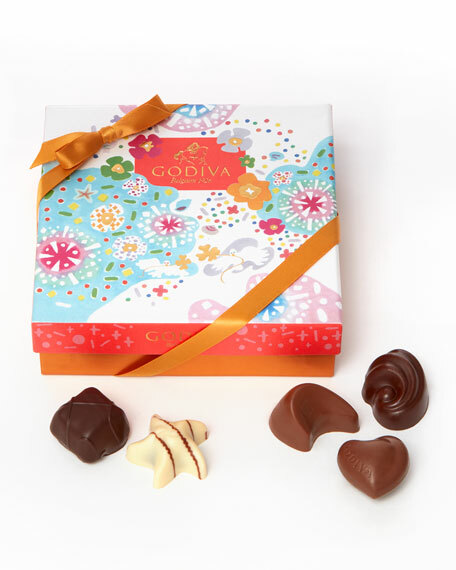 Our 12-piece Summer Gift Box makes for a terrific treat for her on Mother's Day or a generous hostess gift. The gorgeous gift box is finished with a gold ribbon. 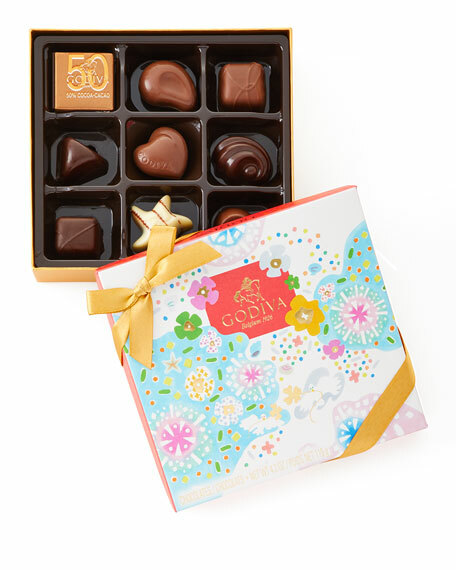 Inside the summer gift box are 12 beloved Belgian chocolates, including milk chocolate carre, dark chocolate carre, almond praline raindrop, milk caramel embrace, coconut pyramid, dark caramel embrace, white raspberry star, and praline crescent. 6"W x 5.67"D x 1.46"T.
Allergen Information: Contains milk, almonds, hazelnuts, coconut, and soy. May also contain other tree nuts.